For the full version of this review, including comments on each of the four stories, visit Starburst. Paul McGann’s Eighth Doctor has come a long way since his frock coat and long hair days – the recent Dark Eyes series brought him ever closer to the looming Time War. Doom Coalition 1, the first of four new box sets from Big Finish, picks up where they left off. But there are no Daleks or Master this time; instead we get a new villain. The Eleven (Bonnar) is a Time Lord criminal with ‘regenerative dissonance’ – his mind is alternately controlled by all eleven of his incarnations so far. Imagine Gollum and Smeagol times five (and a half). When the Eleven escapes from prison, it’s up to the Doctor to track him down. Not on his own, though; he’s still travelling with Liv Chenka (Walker), and British Museum scholar Helen Sinclair (Morahan) joins the team in 1963. Whereas Chenka has been through the wars, Helen comes to these adventures with a fresh enthusiasm – the two companions clashing as Helen gets over-excited about being in Renaissance Florence is a great character-building moment. The four stories are all very different, each with their own strengths; the way they're linked but distinct keeps Doom Coalition moving at an exciting pace. 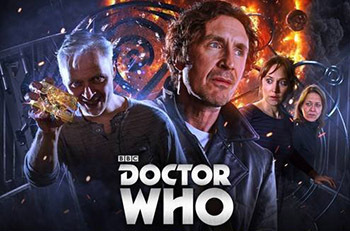 It’s also notable that, despite some clever connections (including to a First Doctor novel and to TV special The Day of the Doctor), this box set is less reliant on existing continuity than the Dark Eyes instalments – so it’s a great in-point for those wanting to begin their Eighth Doctor adventures. With a brilliantly conceived and portrayed villain, two great companions, and the ever-enjoyable Paul McGann, Doom Coalition is a thrilling adventure and, as we’ve come to expect from Big Finish, Doctor Who done incredibly well.